And just like any normal pancake recipe, you have the option to make them all your own by adding fruit, chocolate chips, nuts, peanut butter, etc. But with the natural flavors and sweetness of these pancakes, there is absolutely no need to add anything else! But if you do, I would have to recommend combining cacao nibs, strawberries and / or blueberries… That is my favorite combination! Since these are so naturally sweet from the banana, you can totally skip the syrup. But honey or pure maple syrup work as good substitutes for the normal corn syrup packed breakfast syrup most people use if you are missing that extra sweetness. Bananas work as the flour. They are a very starchy fruit, and work pretty well as a form of solid ingredient in these pancakes. The key to this recipe however, is to make sure you mash the bananas very well. You do not want big chunks in your batter; it will not work properly. For the pancakes to cook and flip like normal pancakes, the batter has to be smooth. I would recommend using a blender or hand held mixer to pulse the banana smooth if you cannot mash it up small enough yourself. Another good tip, for easy mashing, is to use a super super ripe banana. The riper they are the softer they are, therefore the easier they are to mash up. Also the riper the banana is the sweeter the pancakes will be. Ripe bananas have more natural sugars surfaced than unripe bananas… So the riper the banana, the better! Also when choosing a banana, you want to make sure it is good sized. 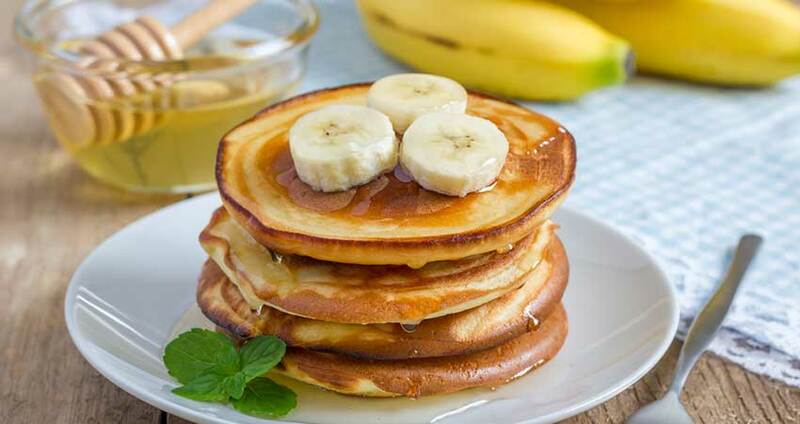 If your banana is too small, you will wind up not having enough batter for your pancakes. After you make these pancakes, you will not be disappointed! The flavor is amazing, the calories are low, and the nutrition content is on point, too. On medium heat, place 1 table spoon of oil of choice in a pan. Mash the banana very well and stir in the two eggs. Make sure you have a smooth batter, no lumps! Stir in the optional ingredients you are using. Pour pancake batter into small circles on the pan. Wait for little bubbles to appear before flipping. It should take about 3 minutes on each side. Repeat with the remaining batter and top with honey if you choose.